The spiralizer isn’t just for making noodles. It’s also just a quick and easy way to prep your vegetables. I remember growing up and watching my mother’s eyes well up with tears as she began her first slice of an onion. She’d sniffle and then the waterworks would start. Maybe she just needed a good cry? 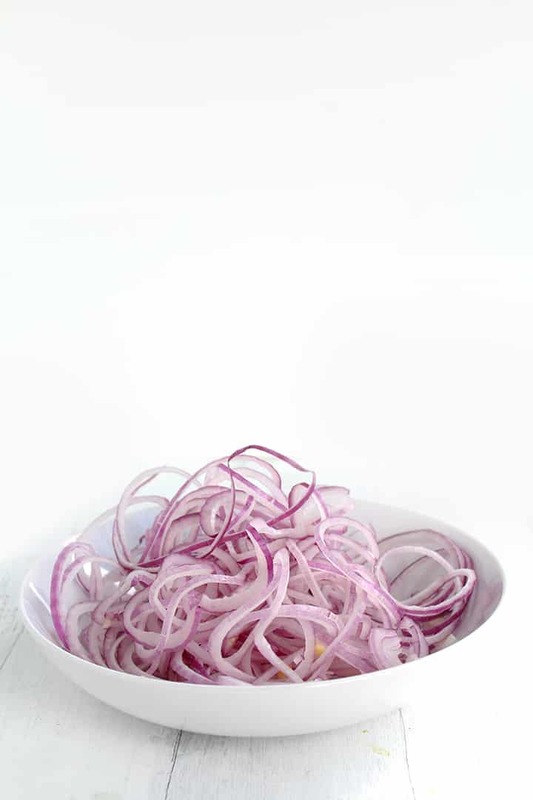 Now, there’s a new way to slice onions: spiralize them! 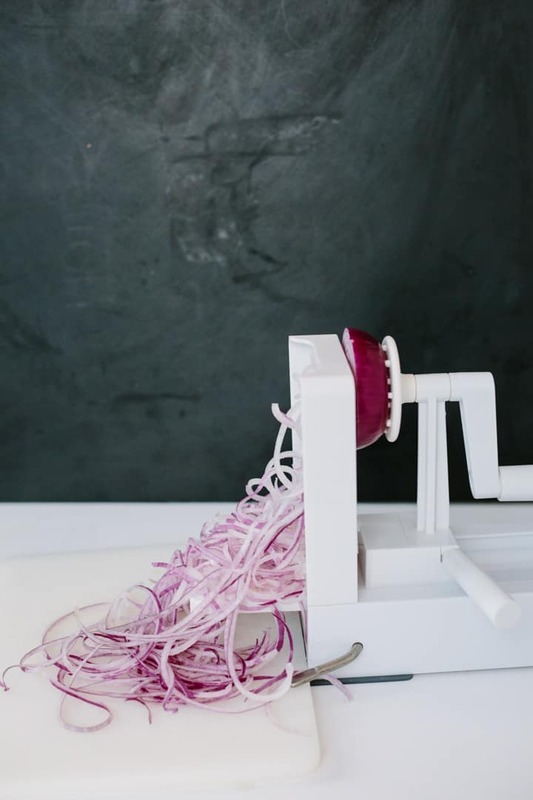 Hopefully, by now, you’re really getting your money’s worth from the spiralizer. 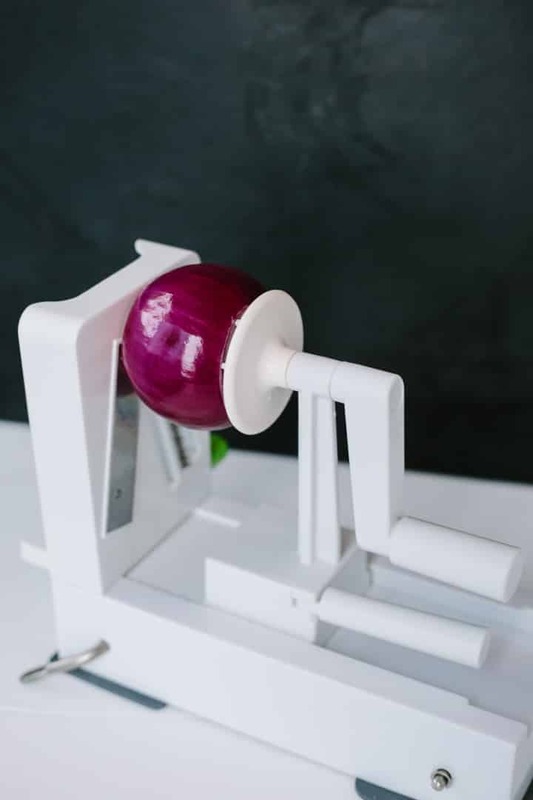 By either using Blade A or Blade C, you can spiralize an onion and get different results. 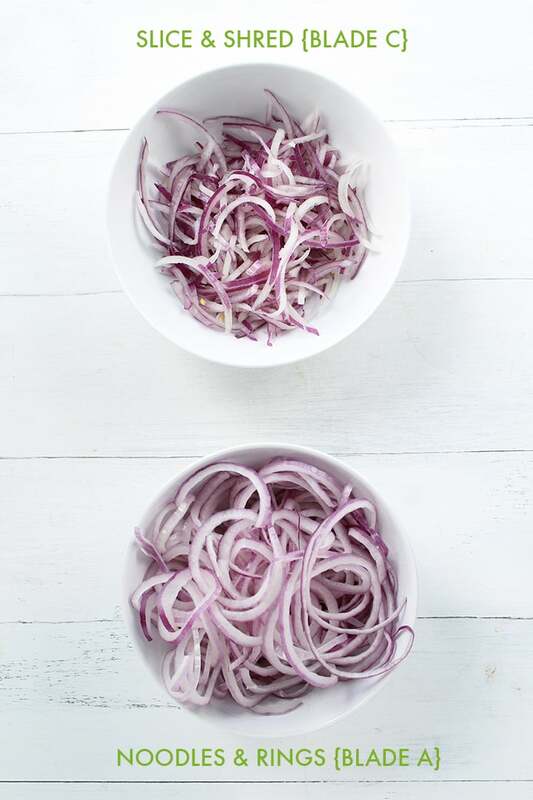 You can either “shred” the onion to get slices (that are perfect for sauteed onions) or you can get longer, curlier strands (that are perfect for frying or baking). 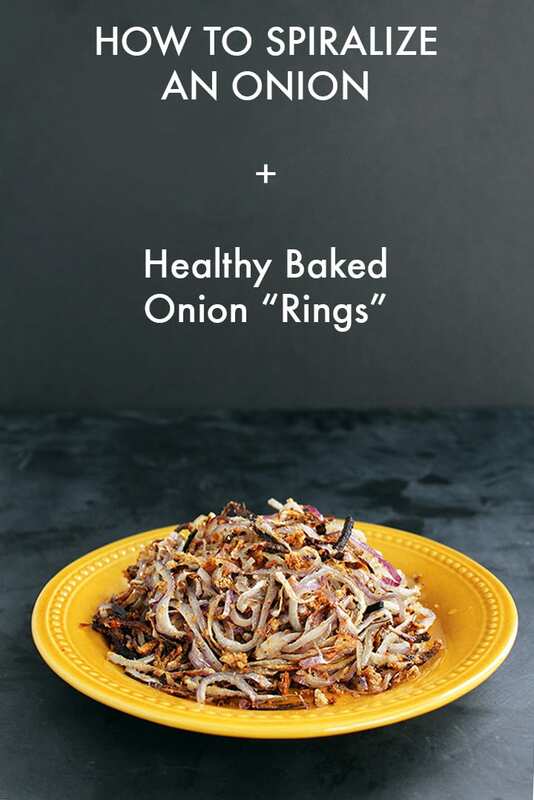 Let’s go over the basics of spiralizing an onion and then I’m going to give you my healthy onion “rings” recipe. Hint: they’re not rings and they’re not fried. They’re a bit different, but just as delicious – and guilt-free afterwards. Start with a large onion. 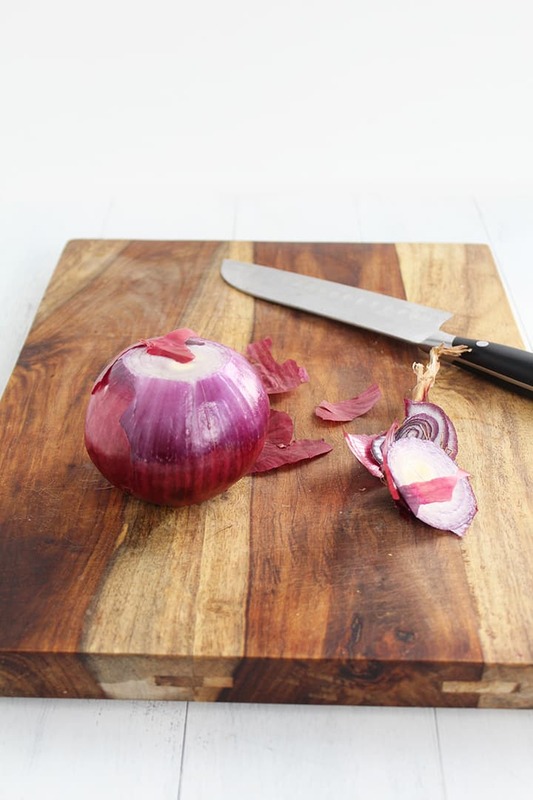 Chop off the ends of the onion and peel off the outer layer of skin. Load the onion onto the spiralizer. These noodles are perfect for making shoe string fried onion rings. But, of course, we don’t like to fry anything around these parts, here in the Inspiralized Kitchen. Instead, we make baked onion “rings” that are really like shoestring onion fries with breadcrumbs, BUT they get the job done, they’re absolutely addictive and they’re easy to make – no fancy friers needed. 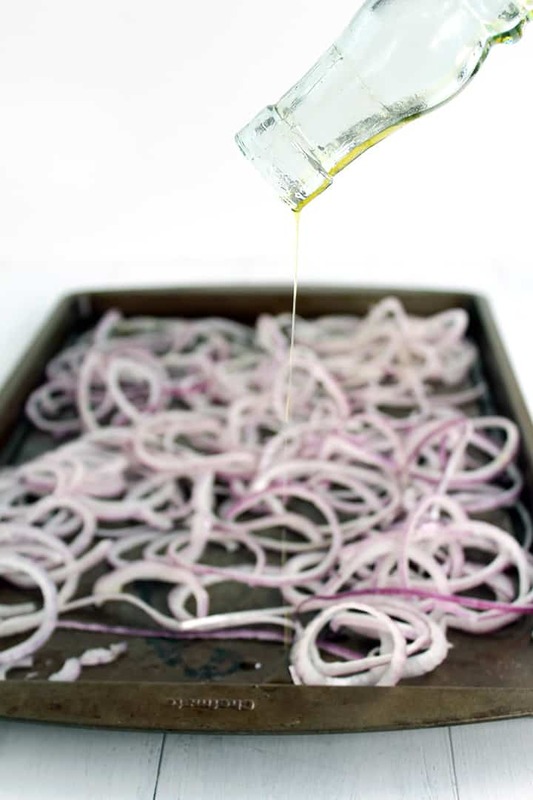 Place your onion “noodles” down on a baking tray, snip roughly with scissors (so they are easier to eat) and drizzle with olive oil. Massage the oil into the noodles. Then, season with salt and pepper and top with freshly made parmesan-breadcrumbs. Massage those into the noodles as well. Bake in the oven at 415 degrees for 15-20 minutes, depending on your crispiness preference. They’re tasty after just 15 minutes. Don’t you want a forkful? Place your bread into a food processor and pulse until breadcrumbs. Pour crumbs into a bowl and add in the parmesan cheese. Set aside. In a large baking tray, place your onion rings. Drizzle with olive oil and massage into the onions. Season the onions with salt, pepper and then pour over the breadcrumbs, carefully coating all of the onions with the mixture. Bake in the oven for 15-20 minutes. Plate when finished and enjoy! Love this!! I want to just put all those onions on top of my salad for a crunchy crunch!! This is amazing!! I could put those onions on everything! I agree with, Tieghan! I want these babies on EVERYTHING. Feel free! They'd be great on a burger, that's for sure! They aren't marked - go to my "How to" page to learn what A, B and C mean! Hi Ali, I tried this today and the breadcrumbs seemed to just burn and then the onions were all I could eat and they were gooey. 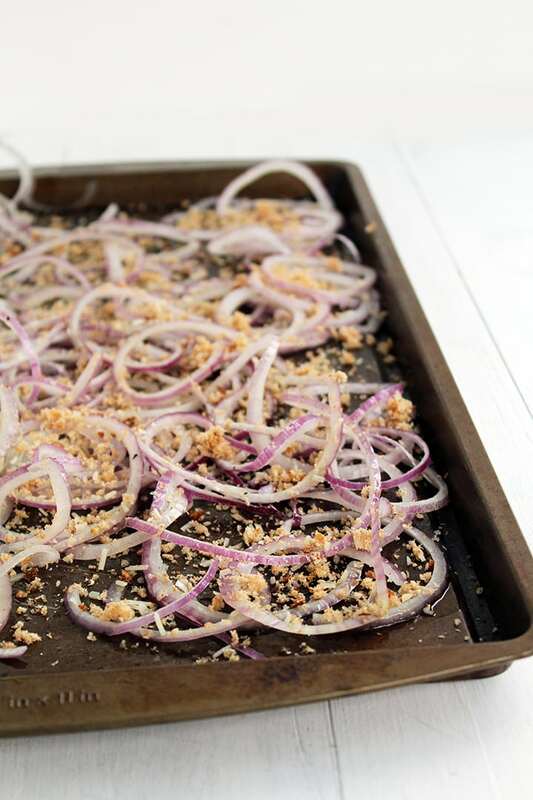 Any tips to make sure the breadcrumbs don't burn too much and stick onto the onions? Priya, oh no! Perhaps dip the onions in egg before and then toss around in the breadcrumbs to ensure that they stick. Hope this helps! So happy I found this blog entry! 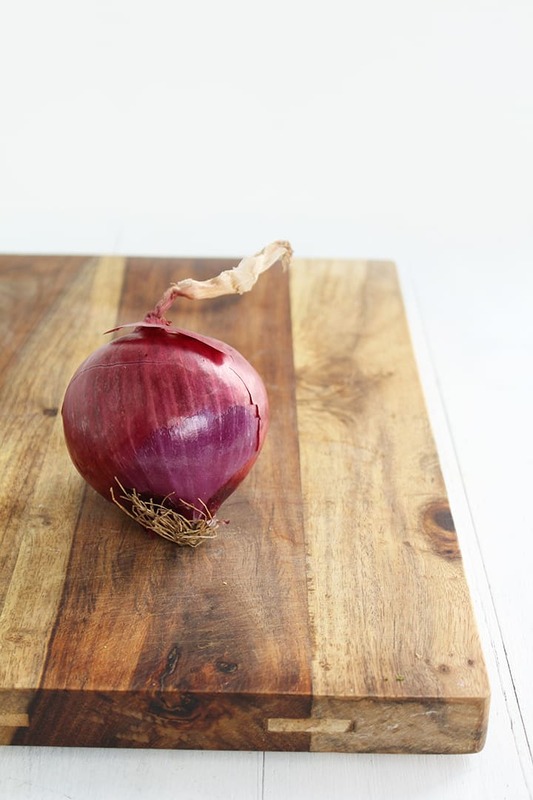 I love red onions! Any suggestions on storing spiralized onions? Can you use store bought bread crumbs on this? Your recipes are great and very creative. When I made the onion rings, I put the spiralized onions into a plastic produce bag ( recyled of course ) then I add the oil, seasonings and bread crumbs. Twist the end and shake the behoozies out it and wah lah! everything is evenly coated and my hands are clean. Works great with all the spiralized veggies you want to coat. Great observation! 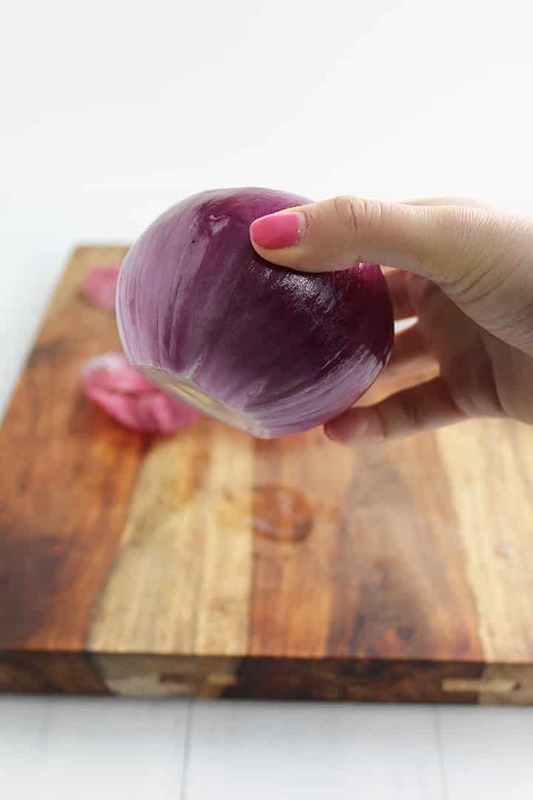 You can also use a food handlers plastic glove (I bought a box and they seem to last forever) OR just a plastic bag over your hand if you don't want to get your hands dirty while massaging the onions. As you can probably tell, I'm with you on that one! Any further tips on how to slice the onion. I used tried it tonight and it turned into more of a mush then a slice. I have the Paderno 4 blade, maybe I used the wrong "Blade C"? Try the flat blade with no triangles! I just found this site, own a Vegetti, and can hardly wait to try your recipes! I'm a bit confused about the comment regarding 'don't fry things around here'. If you use coconut oil to fry them in, which is awesome for you, and you omit the bread crumbs, which are not so great for you, you have a much healthier product that is crispy, light and much more like traditional fried onions! Just a thought. BTW, I plan on getting a Spiralizer this weekend! Can't wait! 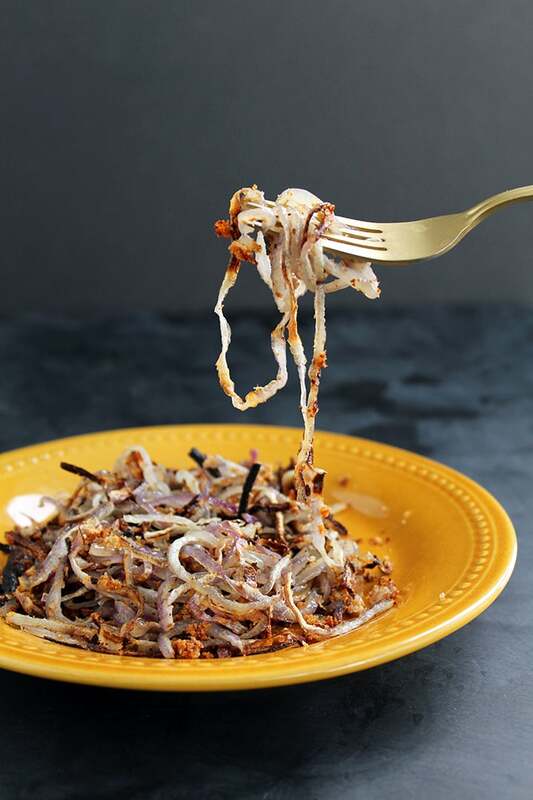 This is one of my FAVORITE spiralized recipes!!! I often use Italian breadcrumbs instead for a little extra flavor. I love making a huge batch of these onions, and then storing them in the fridge to use with other meals. 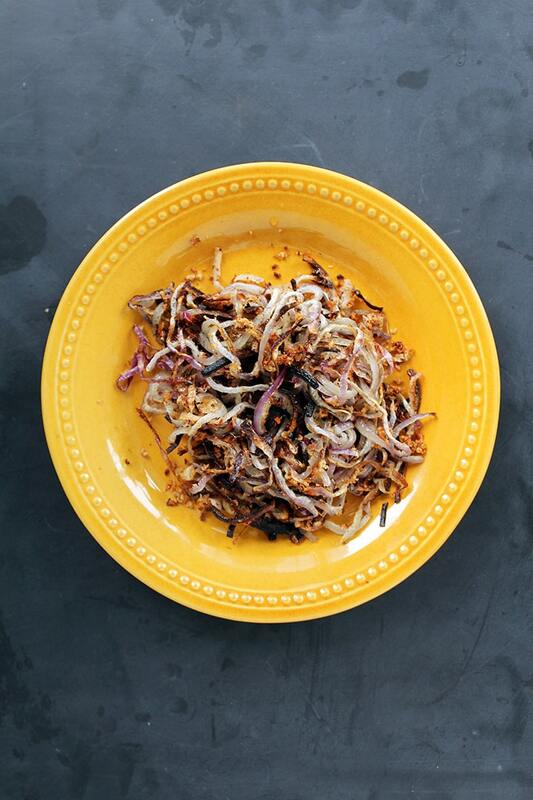 They're like caramelized onions but without having to stand over the stove for an hour! Thanks for your comment, Rebecca! We're so happy you love this recipe. It's one of our favorites! Yes of course! On the slicing/ribbon blade!